and discover themselves on FACEBOOK, fifteen years in the future. Everybody wonders what their DESTINY will be. Josh and Emma are about to find out . . .
Cooke's new young adult book, Flying Blind, is supposed to be a stand-alone. However, I've found that I enjoy the books more if I've read the entire back story, so I'm starting through her Dragonfire series now! Have you read any of these books? What do you recommend? Heat Wave by "Richard Castle"
Those books look so awesome! I love Castle (the show) and the book is on my TBR list! I hope you enjoy reading everything you got! You can check out My IMM if you get the chance! Happy reading! PS. I'm a new follower!! 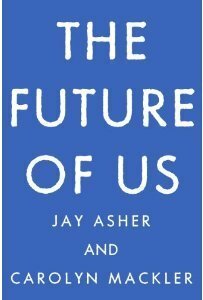 I think The future of Us sounds like it will be absolutely amazing. I can't wait to finally be able to pick it up! Great set! Lost Voices was an interesting book. I want to read Hourglass. I can't wait to read Hourglass, Passion, or Trial by Fire. Those three have been on by "to read" list for months. I'm also thinking about reading the Katie Alender series. They sound really interesting. Have fun reading! !